They may not have known what exactly they were getting into this year when four seniors (Madison Mills, Whitney Koehn, John Willey and Shailee Hayek) and a sophomore (Kate Zakaras) at Elmwood-Murdock High School enrolled themselves into a brand new class; but if you listen to their story, it’s fairly easy to make the assumption their choice will greatly impact their futures. Last year, Elmwood-Murdock (E-M) streamed events at the start of the 2nd semester with Striv. Usually it was a junior high student or someone available to get it up and running for people unable to attend. This year is quite different. A group of proactive and fore thinking high school students approached a teacher, Mr. Garrett Hall, last spring and asked if he would be willing to mix things up a little bit. They asked this English/History teacher to create a class for them: Digital Communications. Hall was not about to let the opportunity for his students go, so he agreed and embraced a new responsibility. The students admitted they did not know what ‘Striv’ was last year. They just knew Junior High kids would stream events and really nothing more than that when they were registering for this school year’s class. They thought this could possibly be a ‘cooler’ form of journalism; so now they could take ‘journalism and cooler journalism’. Willey thought that it was a no brainer to incorporate sports into one of his classes and get a grade for it. As for Mr. Hall, he may have considered the Tech side to be a new feature to his teacher, but this was not hard to deal with in teacher terms. The class was initiated when August rolled around. They did a few weeks of watching Striv videos on the StrivU site and from there, they jumped right into the streaming aspect of the school’s events and ‘hoped they didn’t land on their face’. They class trudged through the initial growing pains, but those weren’t apparent for very long. They quickly started gaining momentum and taking lots of ownership in their work. This didn’t come easy, however. The class is heavily involved in other activities such as football, basketball, volleyball, cheerleading, music and the list goes on. Their key to success is these students have, somehow, realized how to multitask in real-world situations quicker than lots of high school students have. They have treated this class like a job and have admitted it has felt like they are doing that of what a real world job would feel like. A great aspect of this E-M class is they are working hard, but also having a lot of fun and wanting to take on more and more responsibilities. They have gone from streaming alone to conducting interviews to producing commercials start to finish and last but not least, creating their very own news show. From that, they have even branched out to all having their own individual shows/segments. These include a sports show, a show that gets feedback from the student body in interviews and even a segment developed by a student strictly for ‘complaining’…better yet, making that informative opinions backed with facts. They self-appointed themselves to do a special news show for election day (video above), which takes incredible fortitude for teenagers to take on. This class has done all of this evolution in one semester. It’s pretty incredible to, not only witness the quantity of the progress, but also to see the quality that is being generated and produced. The class is very much supported by the administration and even aided by Mr. Novak, Superintendent, in commentary when he’s able. The class agreed that the administration has been ‘really involved and makes sure we have the best equipment so we can do the best work’. They even joked that they have been volunteered by the superintendent for tasks they didn’t even know he was having them do. However, they are always up for it and enjoy the tasks at hand. When they describe a typical week in the Digital Media class, they laugh as they discuss organizing who gets cameras when and where the lapel mics are for interviews and who’s doing newscast shows and who is available to stream events. Even in all of this, they have made life as easy as possible by finding their best solution for the communication. They have adopted a few products in Trello and Slack. These technologies have helped tremendously in communication. The students streaming the events are actually able to talk to Mr. Hall while he is home. This allows him to help produce and send notes when he is not physically there. They create their ‘classroom’ virtually anywhere. 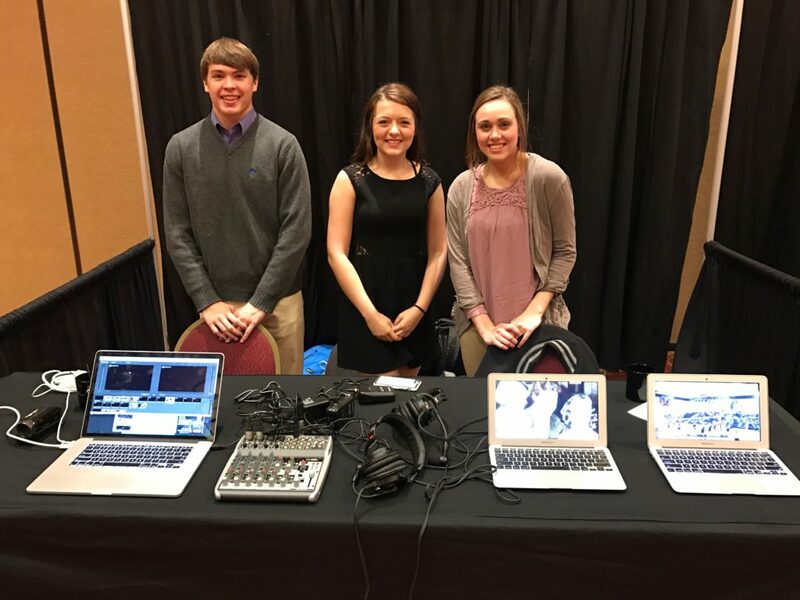 Whitney Koehn, John Willey and Shailee Hayek at the NASB Conference Student Showcase in November. The class is well beyond their years with maturity and understanding of responsibility and owning their work. Although it seems like they have thought of everything they can be doing, they note, ‘there’s no shortage of ideas’. The students admit they ‘all came into this class with really high expectations and with the new equipment, that provides even more opportunity, so now we just need to prioritize due to time constraints’. The class will continue to trail blaze this semester and it is assured they will come up with some really great work. They continue to improve on planning ahead and staying on the same page. Most importantly, they will all continue to develop skills that will benefit them for life beyond high school and college and into the workforce. With four seniors graduating this Spring and headed to college, they are well equipped for what’s in store. They even admit to having interest in journalism areas they didn’t know they had before taking Mr. Hall’s Digital Communications class. A couple of them have even contacted their prospective college inquiring about athlete interviewing and how they fit into that realm. Their proactivity will never be a hindrance in the future in front of each one of them. As for Striv at Elmwood-Murdock, the class is hopeful that ‘there’s going to be a lot more kids interested because they have seen what we have done and they see that this is a fun class…it’s a lot of work, but a lot of fun.’ They agree that it’s the class that feels like it provides that real-world job feel and Mr. Hall leads the charge. He gives the freedom to the students and has provided an opportunity for this class to develop skills and life lessons that he knew they were capable of doing and expand on their abilities. Their advice to other schools or students that are doing Striv or wanting to do Striv is this; it is a new way to express yourself; it has opened up future opportunities; if you have ideas and viewpoints, SHARE THEM! Let your creativity run wild because if you think you’re just cut out for camera work, you may realize you are running your own sports show and have an interest you never knew you had previously. The Elmwood-Murdock Digital Communications class is impressive. From the support the administration provides to Mr. Hall rising to the occasion to last, but definitely not least, the students who took a risk, took ownership and now will see such amazing benefits from their tenacity. We’re honored to watch and be a part of the amazing way you are sharing your school’s story online!